Exercise can be difficult both for people beginning to get into a routine, as well as for those who have been exercising regularly for years. With never ending social engagements, homework, and busy lives, how can we motivate people to regularly exercise and improve their overall fitness? Our application focuses on fitness and motivation, and services users who have difficulty motivating themselves to exercise. It also helps those who want to push their workouts even further. The application is flexible to meet an individual’s unique exercise needs and can easily move with them throughout the day. JourneyFit is able to motivate users by providing clear, actionable directions to them. We use location and calendar information to pinpoint openings within our users’ schedule and promote teamwork through group formation, social interaction and challenges. Great workouts often include personal trainers, music, and a certain amount of preparation before the workout. Those who were most committed to exercise often had goals and a social network to help keep them motivated. Users experienced loss of motivation due to external events that took precedence over exercise. This caused feelings of guilt due to a lack of results. We conducted eight diary studies from both "novice" and "expert" users so we could learn how our participants prepared themselves for a workout, understand demotivating factors, create routines, and pinpoint differences between the two groups’ workout regimens. Our study design included a pre-questionnaire to learn about our users’ current habits, as well as a self-taken audio interview with set, standardized probing questions addressing what they did before, during, and after their workout that day. When our users did not work out, we asked them a different set of questions that focused on a rest day. Novice users were concerned with their form. From these studies, we learned that our users often have difficulty finding the motivation to being exercising. They are very busy between work, school, and other activities, and are often tired when they get home. Everything takes precedence over working out. Because of this, we developed the concept of Jewel, a program that would take advantage of the decline in motivation that our users often felt, and provide opportunities for exercise outside of the traditional gym model. Jewel would activate and "pipe in" when there was an opportunity in our users’ day. Whether at work or at home, Jewel could tailor short workouts for our users. This tied in nicely with our users' interviews and existing research that showed that personal training and planned workouts were effective ways to get a great workout. It also reduced the amount of guilt that users felt for not completing a full workout and would help prevent users from completely falling off the bandwagon and losing motivation. We also learned that novice users were often concerned about form and developed the balance shoe concept that would vibrate whenever our users were exhibiting poor form. In addition, it worked as a personal trainer by letting our users know when they were getting off of their goal pace. Our third concept, the peripheral motivator, focused on our findings related to the benefits of social motivation. By providing data visualization of our users’ and their friends’ fitness activity, we could further motivate them to work out more regularly. We conducted six user enactments with four users to better understand the most effective ways to motivate our users, the most effective types of social interactions, acceptable levels of intrusiveness, and where our users would be most comfortable interacting with our system. Our team found the user enactment experience useful in determining which aspects of each concept were valued by users and, in helping us scope down our final product. Below we outline our study’s primary findings by concept. Overall the most powerful aspect of the Jewel concept is its ability to discreetly motivate the user. All of our participants liked that Jewel could be integrated with their calendars or TV and offer in-context fitness solutions, such as walking around the office a couple of times after a meeting or performing 20 push-ups during a commercial break. Another successful aspect of Jewel was its ability to push the user to do more during their workouts - such as encouraging the wearer to do 2 extra push-ups to beat their personal record. However our participants found the idea of Jewel being on their person at all times and situations too discomforting. One participant bemoaned the aesthetics of Jewel by worrying it would look too much like a Bluetooth headset. This concept proved the most successful compared to the other concepts. Of the three peripheral sub-concepts put forth by the team for this concept’s study, the “Oregon Trail (Periphery Task #2)” sub-concept was found to be the most effective in socially motivating users, compared to the “Journey Across the Country (Periphery Task #1)” or “Competition (Periphery Task #3)” concepts. In general, most participants appreciated the way each sub-concept put their activity “in a real-world context.” This solution is contrary to how many popular systems display social activity through basic “step count totals” or “leaderboards”. One user remarked how he preferred the Oregon Trail sub-concept over the others because it favored collaboration between group members in contrast to the other sub-concepts which put forth more competitive social experiences. Although this concept had many positive results, some negative elements surfaced during our enactments. One is the "creepiness" factor of having the game linked to your GPS location at all times, a feature that would allow the game to launch itself whenever the user is nearby a device running the application. Overall, the shoe concept was the least successful of our three concepts. Some participants found the feature which offered improvements to a runner’s gait useful, especially for runners who don’t quite know what they are doing, but did not grasp how this concept would truly enhance their run in the long-term. One participant remarked at how a shoe showing progress felt “redundant,” because they could almost as easily open a mobile running application and have access to that same information, plus much more. We also found that an overwhelming portion of the participants valued a team-based approach to fitness. Participants liked when activity type and repetitions were specified. Participants did not like being told to “do something” with their exercise time because they felt it was too vague. In our final concept, we made sure to integrate a fitness plan with specific goals to help fulfill this criteria of the end user. This finding could be beneficial to any fitness-based design implementation. JourneyFit motivates fitness users who are already interested in working out, but may struggle with taking the steps needed to exercise regularly by incorporating it into a mobile game. The game accomplishes this by promoting exercise activities that directly impact the well-being of in-game avatars. JourneyFit sends mobile and laptop notifications to users after finding openings in their schedules. Users may accept or decline these “adventure prompt” notifications. If users accept the prompt, they will receive challenges that are tailored to their personal fitness goals and location. For example, if a user has a personal goal of completing a marathon and has a schedule opening while at home on a sunny day, their adventure prompt would involve running a certain number of outside. If a different user had a goal of just “being more active” and has a schedule opening while at the office, their adventure prompt would motivate them to take walk during break instead of using their time to browse Facebook. JourneyFit also tracks how many steps users have taken throughout the day. If a users’ personal step goal is not met, their avatar goes hungry for the day. If step goals are exceeded, extra points can be allocated for future meals, or for avatar outfits and accessories. Our research has found that motivation is the highest when exercising if users have both large long-term and smaller short-term goals that they can reach. This application uses this research, and research around positive reinforcement to motivate users personally. If users are exceeding personal goals too frequently, the game prompts them to consider changing their fitness level or daily step count. 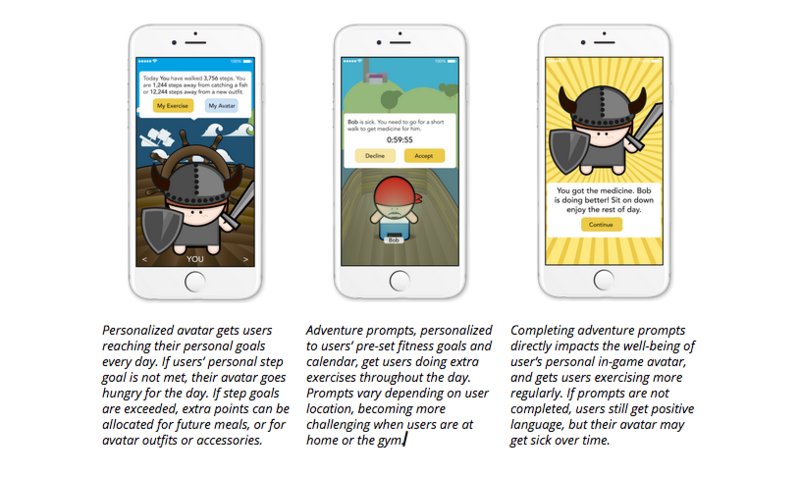 JourneyFit also uses social motivation through team-based interactions with friends’ in-game avatars. 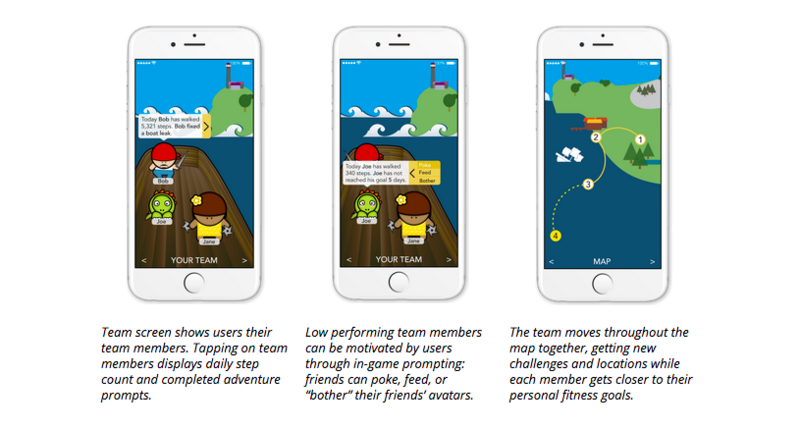 Using the game, teams of users can move forward through levels and get new challenges. Team members keep each other accountable in a variety of ways. If other team members are not meeting their personal fitness goals, users can “bother” each other in-game, sending personal messages, to provide motivation through mobile/desktop notifications. There is also functionality for users to poke friends’ avatars. We are also considering allowing users to help low performing friends out on days their avatar is hungry by “feeding” them. Our demo video introduces the primary value proposition of JourneyFit. It illustrates how the system can be integrated into the busy lives of its users in 3 different scenarios: the home, the office, the gym. JourneyFit would be created for mobile use on smartphones with GPS and step-counting sensors. The game would use data gathered by HealthKit or a similar in-phone health tracking programs to identify user’s step-count and movement. Use of in-phone health tracking programs also allows the game to use information from synced fitness wearables. In the event that a user does not have a fitness wearable that can track calisthenic activity, there is also an in-game option to use gesture recognition. This gesture recognition would use the mobile device’s front-facing camera to identify that users are making the correct gestures to complete adventure prompts. For example, a user prompted to complete jumping jacks could set up their phone’s front facing camera and complete a jumping jack. This movement would be captured by the camera and recorded toward their adventure prompt completion. JourneyFit would use mobile and desktop devices to send notifications to users. Notifications for adventure prompts would be sent throughout the day when openings are identified in users’ schedules based on their mobile calendar application. Users have a choice to accept or decline adventure prompts. Data on repeated declines of adventure prompts based on specific dates, times, and locations would lead to a decrease in prompts during these circumstances. An in-game survey, which launches at the installation of JourneyFit, would allow users to set their own fitness goals, step count goal, personal or physical limitations, and calendar preferences. This information can later be edited through the “My Avatar” screen during game-play. Meaningful adventure prompts would be generated throughout the game by using this information and selecting from pre-loaded fitness schedules. These fitness schedules would be created before game launch with the help of fitness trainers and coaches. For example, if a user indicates that they are training to run a half marathon, they would be put on a fitness schedule with appropriately spaced adventure prompts focusing on maintenance calisthenics and a gradually increasing running distance to 13.1 miles. This example could be contrasted to a situation in which a user indicates knee injury; this user would see no jumping and distance running adventure prompts. The JourneyFit demo video illustrated the benefits of using the system in a number of contexts. However, there were some technical factors - such as what sensors would be utilized and how the system would integrate with wearable devices - that were not addressed in the video that our team felt warranted further discussion. The JourneyFit application will be paired with the Apple’s HealthKit, which is included in all iPhone devices running iOS8. In addition, the system can also be paired to a select number of wearable devices through their API (Application Programming Interface). There are two primary justifications for allowing multiple types of data input. The first, is that by pairing JourneyFit with a wearable device, the application is allowed to track the user’s movements even if they, the user, have left their cell phone at home. Secondly, pairing JourneyFit to a user’s FitBit account - by way of the FitBit API - it will have access to that user’s FitBit profile information, social network and aggregated fitness data. In doing this, JourneyFit can effectively use this information in a myriad ways to motivate its users without requiring additional input on the their part to access this supplementary information. Our team also discussed several methods of extending the JourneyFit experience, should we move forward with the design. One such method is improved context recognition, wherein the application could effectively understand what the user is engaged in at all times to provide more personalized fitness suggestions. One example of this could find the user having ate a meal at a restaurant and, upon leaving, receive a challenge from JourneyFit encouraging them to go for a long walk later in the evening. The team feels that the type of “high-touch” interaction like the one presented above could be the future of personal motivation, giving users relevant fitness information at the most effective times. One of our team’s major usability tradeoffs with the JourneyFit system is that of the camera setup. As seen in the demo video, participants were asked to prop their mobile phone up with the screen-facing camera pointed toward them when performing workouts from home or the gym. Our prior research indicated that both working out with a personal trainer or with a friend can enhance one’s workout experience in ways relating to motivation and accountability. Through this interaction, JourneyFit can act as both the friend and the personal trainer by keeping the user informed of their repetition count and encouraging them to increase that number over time, in addition to sending them in-the-moment motivational messages. The prime trade-off to this approach is one of usability - regarding the effort required on the users’ part - which the group recognizes. Asking the user to prop up their mobile phone before they workout does introduce potential configuration issues such as getting the correct angle right and designing a UI or voice-over that can be intuitively followed during exercise. Another issue with this interaction is the tedium of performing this act on a daily basis. However, we feel that the value to be gained in the approach outweighs the shortcomings of the implementation approach. Comparisons have been drawn in previous reviews of JourneyFit that equate this system to other existing fitness systems such as FitBit. It is accurate to state that there are some overlapping features between the two, the largest of which are step-tracking and social interactions. But how that data collected is integrated and visualized for the users is where we feel the comparison break down. The FitBit system collects the number of steps a user takes during a period of 24 hours. It displays that information in the form of a number, a total number of steps taken per day. Users are given a step goal for each day and are rewarded when they reach their goal through text message alerts and a vibration from their wearable. Like FitBit, JourneyFit collects step-count information throughout the day. But this is where the systems begin to differ. Instead of one overarching daily goal to complete, the user is presented with numerous challenges they can elect to complete throughout the day. Also, instead of displaying the daily step count as the design paradigm like FitBit, the main visual element in JourneyFit is the user's progress in the game. Users are still able to access exact numbers about the number of steps taken or push-ups executed but those numbers are not given as high a priority as they are in the FitBit system. JourneyFit does allow different types of social interaction much like FitBit. But again, the comparison ends upon a closer examination of how those interactions are integrated into the system. FitBit takes a minimal approach to social interaction. It allows users to compete against one another in daily challenges, and the user with the most steps wins. Socio-technical tools such as commenting are allowed, along with controls to “cheer” or “taunt” other members of the same challenge. JourneyFit on the other hand asks users to work together to progress through the game. Similar tools are offered that allow users to interact with one-another, but the main difference is that they are collaborative in nature as opposed to competitive. Additional research and prototyping would need to be conducted in the early stages of game development to identify the most effective team interactions. We would like to focus this research on the habits and motivations surrounding formation of a group in-game. In addition, we would explore the motivation of low performing team members to identify which interactions (poke, feed, bother) are effective in providing fitness motivation, and under what circumstances. These findings would supplement research completed up to this point. In conclusion, we feel that our solution works best for to get our users motivated to work out and stay fit. Our system motivates users by using a collaborative gamification system that helps users to work together to stay fit. We wanted to build a system that adds a social aspect to working out and do so in a manner that does not foster negative reinforcement. Also, the ability to use this system in multiple environments such as your home, office and gym make it useful in a variety of different contexts. Our aim for this system was to have our users be able to use it when they want and where they want. Since it uses gesture recognition to check how well you do your exercise it helps filling in gaps left by the lack of a personal trainer as well. The app challenges its users by sending push notifications to the user based on calendar information thus making it pervasive. The in-game survey that launches at the start of the app when it is first installed makes it highly customizable so that it is tailored around the user. Through our system, we hope users can find working out fun and motivating but at the same time challenge them to work harder and stay fit.